(Note: the statement was released on the 20th of November). “We started our struggle 18 days ago. We, 10.000 prisoners, initially by mess abstinence, followed by hunger strike, fought against the misery of the Greek prisons and the Ministry of Justice’s indifference. From tomorrow, Friday the 21st of November we, the prisoners in the country’s prisons, state that we suspend our struggle by ending our hunger strike. The bill that the Ministry of Justice is bringing to the Parliament pertains to a few of our requests. The minister owes to materialize his promises about the immediate release of the number of prisoners that he announced. At the same time, he owes to take specific measures, concerning all of our requests. We, the prisoners, see this bill as a first step, a result of our struggle as well as society’s solidarity. However, we feel that this, in no way is a solution to our basic problems. What we fought for was, above all, our dignity. And we are not willing to offer it to any minister or warder. We are not going to tolerate any arbitrariness, any convection based on revenge, any disciplinary action to scare us. We will continue to stand up. We demand from the Parliament to totally abolish the limit of 4/5 regarding the penalty for various offences, to abolish the adding of disciplinary actions and the expansion of all favorable articles regarding leaves and release under condition from prison for all categories of prisoners. 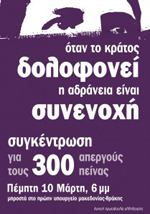 We also demand that the generic proclamations by the minister of Justice concerning the improvement of the conditions in the prisons (such as abolishing juvenile prison, establishment of rehab facilities, community work instead of prison, upgrade of the prison health system, integration of EU laws regarding prisoners rights into Greek law system etc. ), to become laws during the next three months. Finally, we would like to thank the solidarity movement, every organization, political party, media and people that stand for us in whatever way they choose and we declare that our struggle against the prisons/rubbish dumps of people and for our demands continues. This text was leafletted and displayed on a billboard, along with more info material, at the opening event (29 Nov.) of the new social center at the Manchester Amateur Photographic Society building, Platt Fields Park, Manchester, UK (many thanks to Manchester No Borders). It may not sound as exotic as it did in the sixties, yet, Crete is still a popular summer destination for lots of people. Be it for its beaches or the nightlife, folk music or food, mythology or whatever, millions visit the island every year, rendering tourism the most lucrative sector of the islands economy. Who’s doing the dirty jobs? Well, on the bottom, you will find primarily migrants….Behind the flashy lifestyle shopwindow, in Crete – as in the rest of Greece, and anywhere within the Fortress Europe walls – there is the severe exploitation of the migrant, under-paid workforce, employed in tourism, in construction, in agriculture, in house-keeping….this is not just about employers who are racist or unrestrained by law…the whole thing is orchestrated by a predator State, the first to take advantage of them economically in the unending series of documents needed for some fragile and provisional legal status, which is never full, which is seen as some extra bonus rather than as a basic right….yes, it is the same State that kills or leaves people die at the border with Turkey, or on uninhabited Aegean islands…. Not everyone will comply with the “be afraid and silent and mind your own business, be happy with what you got” attitude the authorities want for migrants…. 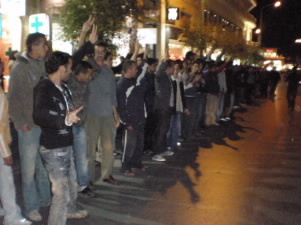 Since November 11, 2008, fifteen migrants in Chania, the Cretan city where they have been living and working for years, also as active members of the Crete Forum of Migrants, have been on hunger strike, demanding the legal status they are eligible for and are being unfairly denied. What they demand is that an unfair law changes,, so that people can prove, commonsensically, how long they’ve been in the country… What they struggle for is dignity and equal rights, for them and their families, for all migrants within Fortress Europe. ….your support and solidarity are very important…. International public statements of support and solidarity, personal, collective or institutional, are very much and urgently needed. 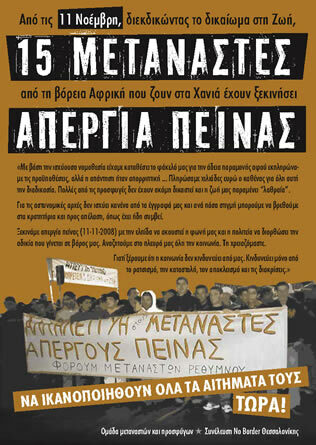 Please, forward them to the Initiative for Solidarity at protoboulia.metanastes.chania@gmail.com(this is the collective established for organizing and promoting the struggle). Read about the struggle in https://clandestinenglish.wordpress.com/. Please, circulate, copy and distribute. The hunger strike has been going on for 16 days now… The migrants’ demands have been falling upon the deaf ears of the government and the minister….The demonstration of the previous evening revealed the great support their struggle is receiving from people in Chania…. The Initiative for Solidarity met with the Region of Crete general secretary S.Tsokas at his office in Heraclion. The Initiative people gave the governor a detailed exposé of the hunger strikers’ demands. The governor said that it was not in his jurisdiction to solve the problem and defended the callous attitude of the Ministry of Internal Affairs (the minister claims that EU legislation stands in the way, as if the same EU legislation, which is already harsh, hadn’t so often been “misinterpreted” by Greek authorities to the point of abuse against migrants…) He concluded by stating that the hunger-strikers have the inalienable right to hunger strike, to fast for as long as they wish, even to their death, and assured the Initiative that the Greek polity will do nothing to suppress the hunger-strike! We should thank the General Secretary for this important concession… In other words, the immigrants can “freely and democratically” die of hunger! 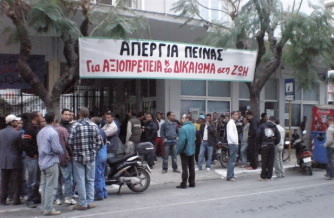 After this, the occupation of the Region of Crete building in Chania was extended. Supporters of the hunger strike decided to occupy the Town Hall, a sound system kept transmitting messages of solidarity, and banners and graffities made it visible everywhere… The two most important government building in Chania are under occupation in solidarity to the immigrants’ struggle! The hunger strikers issued a Public Letter to the President of the Hellenic Republic, the head of State, who is to visit Chania on the occasion of the forthcoming public celebration commemorating Crete’s union with Greece. Since 17 days we, 15 immigrants in Chania, have set off on a struggle for a problem that thousands of immigrants face. Until now, we have already been on hunger strike for 17 days. Our struggle is a fight for the right to live legally in the country that had seemed to us a ray of light and hope in our lives lost in our countries of origin. But hope soon turned into a nightmare. First, on the journey through terror we had to sail to, in order to reach this country. Then, with the conditions in Greece, that hold us hostages; conditions pertaining to our working conditions and to all aspects of everyday life. We have been hunted then, we are being hunted now. “Hey, don’t come any closer, the hunger strike is still on!”… the donut vendor, the taxi-driver and the hunger strikers all laugh together…. A donut vendor used to pass through what is now the hunger strike’s site and sell donuts to the taxi drivers, who also have their stand there … From the day the hunger strike began, the taxi drivers won’t let the vendor come close to the site, instead they prefer to approach him to get their donuts … This is one of the simple ways the people of Chania show their support and humane feelings. The initiative for Solidarity is continuing the occupation of the Region of Crete government building in Chania, following the Secretary’s cruel response to their appeal. The Communist Party of Greece (KKE) MP Spyros Halvatzis visited the site of the hunger strike and had a discussion with the strikers. He pledged that KKE would do everything possible to assist in resolving the problem. Associations of farmers that had been protesting in the streets of Chania for their own issues expressed their support and solidarity with the strike when passing from the site. More than a thousand people have visited the struggle’s site to ask about the strikers’ health and express their solidarity. The list of the associations and people who have publicly stated their support is growing everyday. 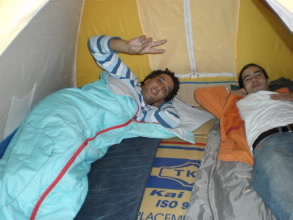 In the night, two hunger strikers were taken to the hospital, after having fainted. The doctors advised them to stay in the hospital to prevent any sudden deterioration of their health. The president of the Coalition of the Radical Left party (SYRIZA) Alekos Alavanos visited the hunger strike’s site and expressed his party’s full support to the struggle and asked the government to resolve the legal unfairness against the strikers and everyone in their situation. […] obstacles placed at the Greek entrance to the EU that prevent Iraqis and other asylum seekers and migrants from entering the European Union or that summarily expel them when they do. 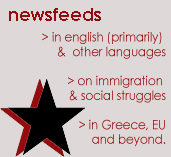 It includes testimonies from Iraqis and other asylum seekers and migrants on both sides of the Greek-Turkish border about pushbacks and summary expulsions from Greece, inhuman and degrading conditions of detention in Greece, Greek police and coast guard brutality and harassment, and the blocking of access to asylum in Greece as well as the denial of asylum and other forms of protection to those needing it. 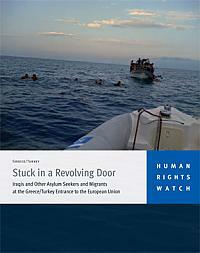 This report is also about abusive treatment of migrants by Turkish border authorities in the border region with Greece, including inhuman and degrading conditions of detention in direct violation of Turkey’s obligations under the European Convention for the Protection of Human Rights and Fundamental Freedoms (ECHR). Two hunger-strikers are taken to hospital due to hypoglycemic and low blood pressure shocks. After receiving first-aid, they joined again the rest hunger-strikers, refusing to give up the hunger-strike…. 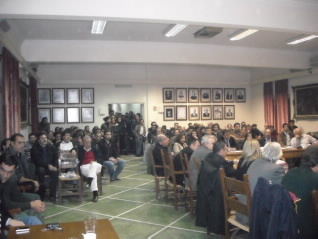 Pericles Korovesis, the Coalition of the Radical Left (SYRIZA) MP and a renowned author, torture victim and fighter against the Military Junta has vivisted the hunger-strike site, expressed his support to the migrants and pledged on behalf of all the MPs of his party that more interventions will follow. Chania Amnesty International branch asks for a serious examination and treatment of the hunger-strikers’demand by authorities. 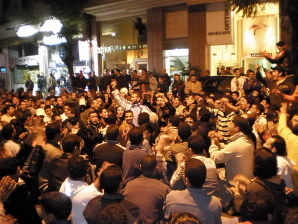 Chania Migrants on Hunger Strike – summary of events 11-20 Nov.
A grand demonstration takes place in the streets of the Chania city centre to accompany the hunger strikers to the new site of their strikers’ camp, in front of the Public Economic Agency facilities. 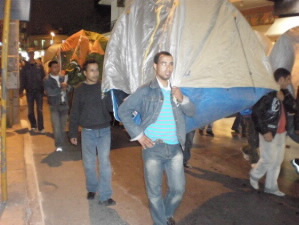 The demonstrators have virtually moved the camp by lifting the tents up in their arms (see photos)! The change of place is due to Mayor Virvidakis’ machinations: this prick has been busy thinking up ways to put the migrants to the added risk of immediate detention/deportation – as if the hunger strike were not enough. This change of place however does not signal defeat or retreat for the hunger strike. On the contrary, the new setting is in the very centre of the city’s economic, commercial and administrative life (lots of shops and public services there). Not to mention that just on the other side of the road (Tzanakaki street) there is an occupied Crete Polytechnic University building, which can offer added publicity to the whole event both creatively and organizationally. As the hunger strikers put it in their statement: “…we are leave the town hall entrance with our heads held high. We do so out of respect for the law, not for the mayor and his opinions. Fighters never leave the battle. They only move to new positions, just like lions like to change their den”. More and more local associations, societies, trade unions, collectives and communities express their solidatity with the hanger strikers, hundreds of signatures have already been collected for the hunger strike’s petition. On the same day, the hunger strikers issue a press release to express their solidarity with the ongoing massive hunger strike across the country’s prisons. In terms of participating numbers and broadness, this has been the most important prison hunger strike in Greece so far, forcing the Minister of Justice to proclaim a new draft of law, partially satisfying the hunger strikers’ demands. The Chania hunger strikers’ support was the natural thing to do, not least because a good half of prison hunger strikers were migrants – the number of imprisoned migrants, in Greece as elsewhere, is disproportionally large. The annual demonstration commemorating the student and popular revolt against the military junta in Greece (1973), was turned in Chania into a mass manifestation of solidarity with the hunger strikers (both migrants and prisoners). 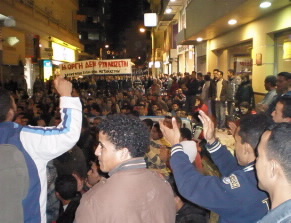 About 800 hundred people attended the demo and supported the struggle. The hunger strikers’ health deteriorates, the first signs of exhaustion become apparent. No sign from the Greek government though. Local MPs of the opposition visit the hunger strikers and express their solidarity. The local Lawyers Bar issues an announcement, supporting the migrants’ lawful demands, and denouncing the unfairness they have been subjected to by authorities. The Chania city council becomes another arena of the migrant’s struggle, with the opposition accusing the mayor of hostile politics against the migrants. The mayor, whose authority is directly involved in the unfair interpretation of the law against the migrants, has been attacked for his overall attitude and his dirty role in putting the hunger strikers in danger, ignoring the mass wave of support within his own municipality’s electorate. Of course, this is not just a local issue, but one that relates to core values and legal regulations in Greece and Europe as a whole. But resistance should also turn against local authorities that behave the way this mayor did, they are also responsible, as the Greek government is for remaining silent. The hunger strikers demand to have a face-to-face meeting with the Minister of the Interior now, to state, loud and clear, their determination and demands. The first immigrant hunger striker in need of hospital aid is already suffering the hunger strike’s severe consequences. 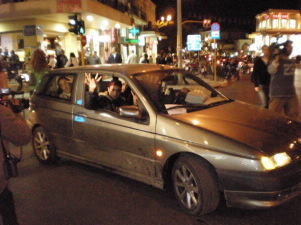 He fainted and was taken to the Chania hospital. Appeal to all organizations and political parties, municipalities and prefectures, labour union centers, trade unions and scientific associations. We ask for the support of political and cultural collectives and societies in Chania, the rest of the country and abroad. To all democratic and aware citizens. 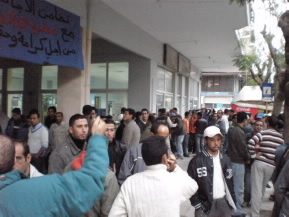 On Tuesday, November 11, 2008, 15 immigrants from North African Countries (Algeria, Morocco etc. 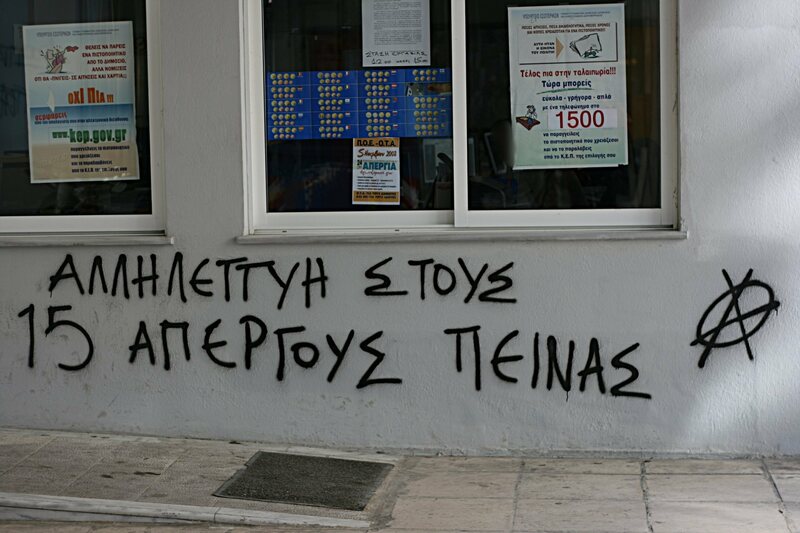 ), active members of the Forum of Immigrants of Crete, began a hunger strike. The hunger strikers are all residents of Chania and they demand residence permits, which will allow them to continue living in Greece legally. We are migrants, members of Crete Forum of Immigrants, living in Greece. We entered the country illegally, as the majority of immigrants do, since the political and institutional regime in Greece does not allow people seeking a better life in Greece to stay there legally, in the country, that is, where they live, work, and raise their children. Since we were eligible to do so, we applied for residence permits in compliance with the law currently in effect; however, residence permits were denied to us, under the pretext that our passport had been issued after 2004, although we had applied for it at the embassies of our respective countries of origin in Athens long before 2004. We then followed the routine legal process of applying for the cancellation of the rejection in the Greek courts, but our demand was rejected all the same. Each one of us paid thousands of Euros during this process. Many cases have yet to be tried in court, and this delay is forcing us into “clandestine” status. For the police authorities, none of our documents has any validity, so that the prospect of finding ourselves in detention rooms or deported is extremely likely, since this has already happened to people like us. Existing migration policies and laws clearly aim at our marginalization, promoting ignorance not only of the problems we are dealing with, but also of our social existence as a whole. Faced with that, we have decided to take this drastic action to raise awareness around our issues and difficulties. We claim the right to live and work under decent conditions. * it is vital that the injustice of us being held hostages of an unfair legal status, ends. The current regime either excludes us from legalization processes, or threatens us with “legalization” in the terms of Fortress Europe. * It is vital that the renewal of residence permits is disconnected from the possession of a certain number of revenue stamps. This is extremely unfair for migrant workers, for whom informal labor, with no insurance whatsoever, is the rule and the only option. This regulation forces us into buying extra revenue stamps with their cost burdening exclusively the migrant worker. * It is vital that the right to family unification is disconnected from proving a certain – high – annual income, since this requirement forces us into vouching virtual incomes from rural jobs – and into paying high taxation. * It is vital that the cost for the residence permit issue fees is lowered, and that it corresponds to the real cost of the bureaucratic process. * It is vital that municipalities employ more people for work in the issuing and renewal of residence permits. Furthermore, it is unacceptable that the essential information for applying is not available in the migrants’ own languages. The Forum of Migrants of Crete has already pledged to assist Municipalities in making this possible. * It is vital that the detention and deportation of minors ceases. * It is vital that all children born in Greece are allowed to be registered in municipality tolls, obtain certificates of birth, and be granted Greek citizenship – as it happens in the rest EU states. * It is vital that international human rights conventions and treaties are respected in Greece. that residence permits are issued immediately for all those who are eligible for them according to the law (hundreds of migrants in Chania alone). This could be done either through a common sense interpretation of the existing law, or through a reformation and broadening of the acceptable ways for proving entry into the country. We have been struggling for all the above in the past years. We have participated at public events and discussions along with our fellow-citizens, as well as with institutional stakeholders and services; we have taken part in mass demonstrations and protests. We have exhausted all options we had and we have paid lots of money. We begin this hunger strike so that everyone hears our voice, so that the state puts an end to the injustice against us. We are ready to sacrifice our health and even our life, so that society understands that we immigrants have problems threatening our very life. We make an appeal for active and daily support and solidarity to all migrants living in Chania and the rest of Greece, to all democratic and aware Greek fellow-citizens. We want all society to be on our side. We need it. We expect support from political parties and members of parliament, municipalities and prefectures, Labour Union Centers and any trade union and scientific association. We ask for the support of political and cultural collectives and societies in Chania, the rest of the country and abroad, because we know that our struggle concerns everyone. Because we know that what threatens the society at large is racism, oppression, exclusion and discrimination, and not us. 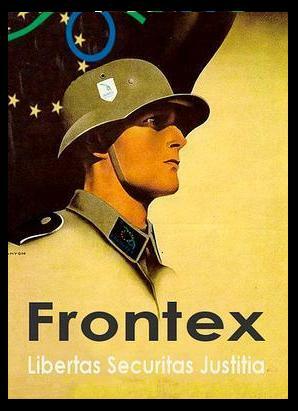 Thousands lives of migrants are in everyday danger to frontier passages, police stations and refugee camps, not only in Greece but in every part of EU since decisions, such as European Migration Pact and Return Directive, eliminates legalization and promotes 18 months imprisonment for those who enter the EU without papers. This very moment, member states and their capital masters take an active role for policies that destroy the life in Africa and Asia. EU spends a lot for more refugee camps, FRONTEX’s operations and compulsory presence of migrants at neighboring states of EU, according to Dublin Regulations. Ultimate goal is to guard the borders. Its disguise is the protection of security and order of the most privileged European citizens from terrorist threats. Governmental authorities exercise inhuman, racist and against to migrants policies in Greece. Deportation, encouragement of police violence and repression in general are their means to serve the interests of the capital and the state. These policies compel to hostage situation thousands of migrants and conclude to negative official decisions at refugees’ claims for the recognition of the refugee status. Now that dead bodies are found in Aegean and in Evro’s coasts, refugees are deported, thousands of migrants are hold in refugee camps and police stations and people are killed, silence and disregard means allowance. It’s already been a necessity a common struggle to be formed from both migrants and refugees that could define its own independent class consideration, not a role for an intervener, to discredit actively state’s policies exploitation and consent. We believe that this is the only way to defend our lives and dignity. This way, we could prove that migrants can organize themselves and pretend to their rights, based on their needs and their will to change their lives. Nevertheless, there are a lot of examples that prove that migrants’ actions managed to hassle and rattle the state. We can only recall the last rebellion in prisons of Greece, with the great share of migrants and refugees. According to the above, we call for a second meeting at December 3rd at “Gefyra” (21 Sp. Trikoupi, Exarhia) all migrant and refugee groups and persons and those who want to express their solidarity, to put forward our practical proposals for the continuation of our struggle. We have nothing to celebrate, we have plenty to fight for! The situation for us migrants hasn’t changed that much since we first came here. One of our biggest problems is the residence permit: it takes so long to get one that we feel like we are being held hostages in this country. We can’t be equal and free if we are being deprived of our basic rights. We demand unconditional residence permits for all, independent of insurance and municipal fees, right now! Immigrant children who are born here in Greece face racism and discrimination as soon as are brought into the world. The Government probably considers them phantom children: They are not registered anywhere! The moment they become 18 years old, they are suddenly held to be migrants in their very birthplace. We demand the registation of all children with no discrimination, right now! In the last years the right of political asylum in Greece for those who are refugees of war or political refugees has become a luxury. Last year only 0,2% of all applications were granted. We demand asylum status for all refugees, right now!